It’s the aftermath of Restaurant Wars and we’re down to eleven chefs following the elimination of Nini and Pablo. Or are we? We rejoin the chefs as they trudge off to the Top Chef Kitchen, exhausted from the crucible of Restaurant Wars. But for us who have been following Last Chance Kitchen, we know they’re in for a surprise. Three Top Chef vets—Brother Luck and Carrie Baird from Top Chef Colorado and Jim Smith from Top Chef Charleston—have been battling it out with this season’s eliminated chefs for a chance to get back into the competition. It’s now down to Nini and Brother Luck for the final spot, and our chefs walk right into the middle of that throwdown, which is a mini Restaurant Wars challenge. Both chefs have had to come up with a concept and submit one dish for Tom’s critique. They now have to rework that dish based on his critique and also offer up two other dishes to show how their restaurant would fulfill their intended concept. As Tom notes, Restaurant Wars requires a team, and the two Last Chance Kitchen finalists have already drawn knives to select their team. Helping out Nini are Michelle, David, Justin, Brandon, and Eric. On Brother’s team are Brian, Kelsey, Eddie, Sara, and Adrienne. Nini, never the shrinking violet, immediately puts her team members to work on her dishes. Brother is admittedly at a disadvantage, not knowing any of this season’s cast and having no idea of their respective strengths in the kitchen. For the first dishes, Nini has a po’boy-style fried shrimp with fish sauce, in the style of her “Mekong River Delta meets Mississippi River Delta” concept. Tom likes the flavors but finds the breading dry. Brother has a tempura jalapeno popper with a soy/sesame pickle. Tom doesn’t find the pickles to have been brined long enough and wants more Japanese flavor for his vague “Southwest meets Japanese cuisine” concept. Fifteen minutes go by and the chefs’ second courses come out. Nini offers a lemongrass pork chop with a corn and tomato salad. Tom likes the use of spice and herbs, but finds that the pork itself lacks a little flavor. Brother has a cumin-dusted scallop with yuzu guacamole, which is nicely balanced and boasts good texture and acid. Finally, the third courses come out and Nini has gone balls-to-the-wall by offering a dessert of tapioca pudding with bananas foster with coconut foam and toasted coconut. Tom finds that this dish is her most successful in terms of epitomizing her concept. Brother has seared tuna with pico de gallo, cherries, apple, bonito, and beurre blanc. Tom loves Brother’s use of bonito in bringing a smokey quality to the dish. The current season’s chefs are all clearly rooting for Nini to come back, even those who worked on Brother’s dishes. Alas, Brother’s dishes win Tom over and Nini’s time on Top Chef has come to an end (incidentally, how crazy is it that we’re five episodes in and only one chef still in the competition has won an Elimination Challenge?). Nini had just a few missteps in her dishes, and that’s enough to knock her down to second. She’s engulfed in hugs from her fellow chefs, who are visibly not thrilled with Brother entering the competition—not because they don’t like him or are intimidated by him, but because they don’t know him and would prefer someone from their own season to come back. Tom apparently isn’t great at reading a room and he barrels forward towards the Elimination Challenge, oblivious to the mood of the crowd in jovially declaring that he needs a stiff drink. Thankfully, Padma (who arrived in time to present Brother with his Top Chef apron for rejoining the competition) is much more socially observant and tones down her own energy level. For this week’s Elimination Challenge, the chefs will be catering a 1920s-themed party in Louisville—a time when Prohibition was formally in place, though undermined through widespread hosting of underground boozy shindigs, like the one the chefs will help recreate. Each chef will select a cocktail that was popular in Kentucky back during Prohibition and have to create a canapé inspired by it. We have southside fizzes, old fashioned, something called “The Last Word,” a cocktail named “Twelve Mile Limit” in reference to the fact that patrons would sail twelve miles from the coastland in order to circumvent Prohibition . . . this sounds like a really fun challenge. As the winner of the Quickfire/Last Chance Kitchen, Brother and his team go first in selecting their own cocktails, followed by Nini’s crew. They head to Whole Foods for 30 minutes of shopping before engaging in three hours of prep in the Top Chef Kitchen. This includes more hilarity on the part of Eddie—seriously, between the ribbing over his exorbinant spending from Episode 2, to the judges’ constant comments about how he still looks terrified at Judges Table, even when he’s in the top . . . is there any more inadvertently funny/endearing chef on the show other than Eddie? He’s quickly becoming one of my favorites in the kitchen. Anyways, he’s trying to reduce a pot of cream so that it breaks and releases dairy solids, but a series of chefs express concern over the bubbling pot and either attempt to alert the owner (Eddie is aware, he assures them) or turn off the burner. Good intentions, but counterproductive. 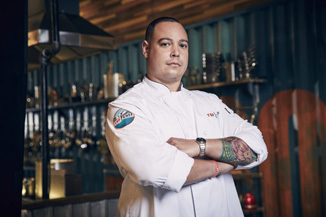 Meanwhile, Brother is still adjusting to his new life on Top Chef. He’s getting flashes of déjà vu cooking in the Top Chef Kitchen, and he acts like a transfer student to a new prep school when he returns to the Top Chef house, not sure where he should put his things, who he should decompress with, etc etc. I sympathize with him, but only up to a point. His alienation from the other chefs is borne of equal parts (1) the fact that he is, indeed, new, and thus it feels to the other chefs like there’s an outsider invading the house, and (2) Brother’s own brash personality, which can come off as stand-off-ish. After a good night’s sleep (Brother apparently gets a whole bedroom to himself, which is a pro and a con, for different reasons), the chefs head off to the absolutely gorgeous Seelbach Hotel in Louisville for their Elimination Challenge. Two chef in particular are totally in the weeds. Eric has set for himself the task of shucking 200 oysters for his dish—a monumental task that invites skepticism from Kelsey that he’ll be able to finish and prep his dish in time. Meanwhile, Brian is totally behind schedule. In order to finish cooking his homemade sausage, he throws all of the meat on the cooktop in order to get it done. And because he doesn’t have time to sauté his gnocchi, he throws them into the fryer. The only other chefs who’ve won an Elimination Challenge have both been eliminated—will Brian fall victim to the same curse?